A West African court has found Niger's government guilty of failing to protect a woman from slavery in a landmark case for the region. The court found in favour of Hadijatou Mani, who says she was sold aged 12 and made to work for 10 years. A judge ordered the government - which says it has done all it can to eradicate slavery - to pay Ms Mani 10m CFA francs (£12,430; $19,750). Despite being outlawed, slavery also persists in other West African states. "I am very thankful for this decision. It was very difficult to challenge my former master and to speak out when people see you as nothing more than a slave," Ms Mani said. "With the compensation I will be able to build a house, raise animals and farm land to support my family. I will also be able to send my children to school so they can have the education I was never allowed." Mossi Boubacar, a lawyer for Niger's government, told Reuters news agency that the government would respect the court's decision. BBC West Africa correspondent Will Ross says the ruling is embarrassing for the government of Niger and sends a strong message that it needs to do more to implement the law and end slavery. It could also have huge consequences for thousands of other people who have been kept in conditions of slavery across the region, he says. Ms Mani, now 24, says she was sold to a man called Souleymane Naroua when she was 12. The price was the equivalent of about $500 (£315). She says she was forced to carry out domestic and agricultural work for the next 10 years. Ms Mani says she was raped at the age of 13 and forced to bear the man's children. "I was beaten so many times I would run to my family," she told the BBC's World Today programme. "Then after a day or two I would be brought back. "At the time I didn't know what to do but since I learned that slavery has been abolished I told myself that I will no longer be a slave." In 2005, her master freed her and gave her a "liberation certificate", reports Anti-Slavery International, which helped her bring the case. But when she left him and tried to marry another man, her "master" said they were married. A local court found in favour of Ms Mani and she went ahead with her new wedding. But this was then overturned on appeal and she was sentenced to six months in prison for bigamy. She took her case to the Court of Justice of the West African regional body Ecowas earlier this year. Ms Mani accused the government of Niger of failing to protect her from slavery, which was criminalised five years ago. A local organisation fighting to end the practice says there are more than 40,000 slaves in Niger. But the government has said such figures are exaggerated. 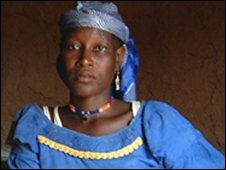 Anti-Slavery's Romana Cacchioli told the BBC that her group had managed to free about 80 women from slavery in Niger over the past five years. The Ecowas court ruling will be binding on all member states and so will have consequences for people being kept as slaves beyond Niger, the BBC's Idy Baraou reports from Niger. For generations, the children of a slave have automatically become the property of the slave master. Ms Mani says one of the reasons she has taken this court action is to secure her two children's freedom and ensure they do not have to endure the same fate. Slavery is also still practised in Mali and Mauritania. Aidan McQuade, the director of Anti-Slavery International, told the BBC the case would be crucial in highlighting the plight of slaves in Africa. "This is very important in terms of the community of nations, and particularly the African community of nations looking at other countries within that region and saying: 'What standard are we expecting each other to be held to in relation to international and national law?'"